AC Moore Weekly Ad Circular sale, valid April 21 – April 27, 2019. AC Moore Coupons, best deals, savings and sale on: Caron One Pound or Lion Brand Pound of Love Yarn; Ready to Finish Wood Birdhouses, Boxes, Trays or Shelves; Elmer’s Project Display Board; Stitch Studio by Nicole Pound of Stitches Yarn; Studio or Premier Stretched Artist Canvas; Open Stock Premiere, Sharpie or DecoColor Paint Markers; Timeless Decor, Malden Barnside or Main Street Farm House Wall Frames; Liquitex or Golden Artist Colors; Wilton Baking Pans; Gildan Color or White T-Shirts; Lion Brand Homespun, Wool-Ease Thick & Quick or Patons Classic Wool Yarn; Martha Stewart Scrapbooking Tools; 120-pc Wooden Art Set or Traverse All Purpose Easel; Melissa & Doug Activity Kits; Licensed Puzzles; and much more. 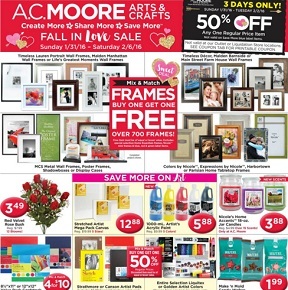 Find all deals, offers and coupons in the latest AC Moore Weekly Sale Ad Circular.